A platform to significantly accelerate mobilizing existing enterprise applications of our enterprise customers in multiple industries, such as Financial Services, Manufacturing, Logistics, High Tech and Consumer Products, for their mobile users – both internal as well as external. Xoriant Enterprise Mobile Platform (XEMP) works with various applications in multiple industries and multitude of mobile devices, requiring minimum change to your current environment. 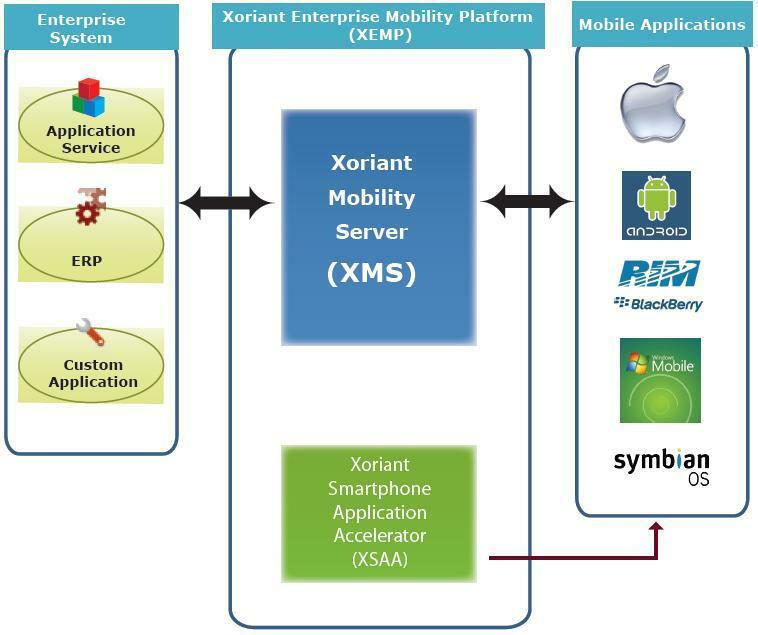 Xoriant Mobility Server (XMS): XMS abstracts the business processes and data elements of the underlying enterprise applications to be mobilized and interacts with the mobile devices through Xoriant Mobile Apps Accelerator. XMS contains infrastructural components like Domain Model, Device Tracking and Licensing, Notification Service, Job Scheduler Service and is multi-tenant capable with an Open Standards based Service Layer. Xoriant Smartphone Apps Accelerator (XSAA): XSAA is a set of building blocks available on all major Smartphone platforms to help speed up development of mobile applications. XSAA can be used independently for non-enterprise pure mobile applications, while it can be used in conjunction with XMS for mobilizing enterprise applications. Key building blocks include Networking, Synchronization Service, Sensor Management, Location Management and Social Media Integration components.